There has been a big shakeup in the National Basketball Players Association. NBPA President Derek Fisher announced this week that Billy Hunter, who has served as Executive Director of the NBPA since 1996, is now on indefinite leave from his position. In a lengthy report recently made public, Hunters’ leadership of the union was called into question as well as his blatant nepotism. He has had various members of his family on the payroll of the union for years now. The move is seen as a first step towards the permanent removal of Hunter….and the rest of his family. 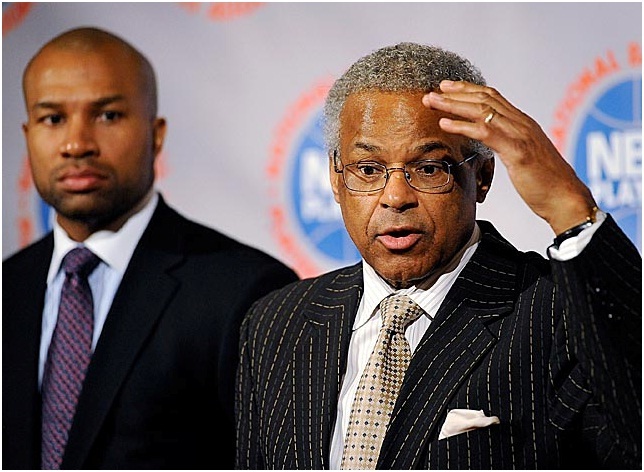 Fisher and other members of the NBPA have been involved with inquiries into the union’s financial and business practices for over a year now and the result was a damning 469 page report that details Mr. Hunter’s various short comings. In a statement released to the press, Fisher said, “Unfortunately, it appears that Union management has lost sight of the NBPA’s only task, to serve the best interest of their membership”. While the report stopped short of accusing Hunter and his staff of any actual criminal activity, it directly called into question his stewardship of union finances and failure to properly manage conflicts of interest along with a long list of acts by Hunter which showed poor judgment and which served his own interests above those of the players union. The actions were “approved unanimously” by an interim executive committee consisting of Derek Fisher, Chris Paul, James Jones, Matt Bonner and Roger Mason Jr… Speculation is ripe that Fisher is positioning himself to take over the Executive Director position once Hunter is gone. In his last move, which proved to be too little, too late, Hunter removed family members from the union payroll, terminated a contract between the union and his son’s financial firm and a presented a plan to reorganize the union staff and the adoption of anti-nepotism and conflict of interest practices. “Immediate change is necessary and I, along with the Committee Members, are committed to driving the process, as difficult as it may be,” Fisher said. “We ask for the cooperation, trust and patience of the Players, their representatives and some of our hard working NBPA staff as we navigate through this situation.